Getting married in France seems like an amazing idea, but it can be difficult sometimes to understand where to start from. Understanding what you can get for your money is essential, as your decision on whether to celebrate at home or abroad will depend on it. In case if you are not sure how much should you budget for a pretty wedding reception in France, reading this article will help you to have a more clear idea on prices here. So get your calculator ready and let's define together how much your wedding in France can cost. The average price tag for renting a château is around 5k€. Small and less famous castles might ask for 3k€, whereas most popular ones will be charging around 7-10k€. Worth of considering, isn't it? I generally budget somewhat between 110€ and 130€ per person. At this price, your dinner is sure to be of a good quality, and will include cocktail, starter, main course, dessert, softs, couple of glasses of wine and the service. Sometimes, it will also include basic rentals like tables, simple chairs and art de table. In case if you rent a venue that also acts as a restaurant, count somewhat between 200€ and 400€ per person, depending on the reputation of the place. This is always the case for luxury hotels and palaces, and sometimes for other private maisons that offer venue + catering packages. Prices can vary dramatically depending on trendiness of the photographer and videographer, yet they are much lower than in the US. The starting price for both photo and video is around 4,5k€ for ten hours of presence. For bigger events however, ten hours are not enough to capture bridal morning, couple photoshoot, ceremony, dinner, wedding cake and a party. 12 or even 15 hours of service are more realistic and will cost from 8k€ to 10k€ for both photo and video. This is perhaps the only expense that is absolutely impossible to estimate with a precision, as everything depends only your wishes. At So Special Evens, we LOVE flowers and beautiful decor, so for a cosy wedding with 30 guests, I would recommend you to budget around 3,5€. The problem we have here in France, is that there are very few companies that rent beautiful furniture and tableware, and prices are always very high. So if you are dreaming about instagram inspired gorgeous decor with tons of flowers and amazing furniture, you should budget around 6k€ for both flowers and rentals. Make-up and hair artists' services are priced differently depending on the "trendiness" and the experience of the person. The starting price tag is 250€ for both make-up and hair, however the price can go up to 700€. The average expense for a bride and two bridesmaids would be around 1000€. A reasonably good DJ will charge you at least 500- 700€ for his services. Add anything between 500€ and 3000€ for sound system and lights (the price will depend on your venue requirements), and you will get the average price of 1500€. Life music transforms any event in to a classy reception and sets the mood and the tone of the event. A duo or trio will charge you 750€-1000€ for two hours presence (perfect for a cocktail). Should you want to have a band or pianist, the bill can go up to 3-5k€. So, what is the amount your calculator shows you? Is it in line with what you have been expecting? Want to start planning your wedding in France and would like to know more about services I offer? 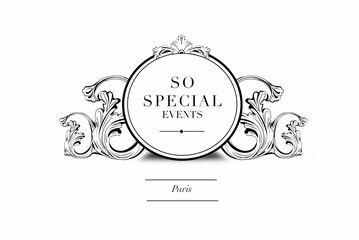 Feel free to email me at katerina@sospecialevents.com and I will be happy to make your wedding planning in France easy!